Dream a little dream with us. Dream Vegas launched in 2018 and has since then offered a great Casino experience. This Casino is part of the White Hat Gaming group, which also offers other great brands such as Casimba and Grand Ivy Casino. The group has licenses in Malta, the UK, Curacao and Sweden among others, so you can feel safe registering an account and making a deposit. First reason to play at Dream Vegas is the massive 200% up to €2500 bonus they offer. Second and third reason would be the 40% bonus and the 60% bonus you get on your subsequent deposits. Now, if you need more reasons than three to sign up at a Casino, Dream Vegas have some more aces up their sleeves. How about 37 different Jackpots, with the largest at the time of reviewing being Mega Moolah at a world record €18.9 million! Still not enough? How about the Car or Cash promotion where every month a VIP has the chance to win a Range Rover. We say VIP, because the rules of the promotions are you have to deposit at least €10 000 in one month to even get a ticket to the raffle for the car. However, if you think you fit this criteria, go for it and we wish you the best of luck! Perhaps you can even go for the Mega Moolah jackpot whilst going for the car. Although, we doubt a €35000 car means a lot if you have just hit a close to €19 million jackpot. Dream Vegas really is a dream come true when it comes to the welcome package. A massive 200% up to €2500 plus 50 bonus spins on your first deposit. The second deposit of 40% up to €3000 and the third of 60% up to €1500 makes this welcome package total and amazing €8000 of potential bonus funds. The 2nd and 3rd deposit also gives you 30 and 40 bonus spins respectively. No sticky bonus for UK players, Sticky for players from other countries. A great part of the welcome is the No Sticky feature, which means you use your cash before your bonus money. Therefore if you win big before you lost all of the Cash, you can request a withdrawal and the bonus will be forfeited. The 35 times wagering requirement on both bonus and deposit is a high one compared to other online casinos. However, as it is 200% bonus instead of 100%, the effective wagering requirement is 52.5 times your deposit. Which in the end is not too shabby, and should be tried and enjoyed. After signing up, we headed to try out one of the more volatile games on the site. We set our sights on Fishin’ Frenzy from Blue Print gaming. For those of you who haven’t tried this game yet, we recommend reading the Slot review available here. This was one of those times when everything went right, as opposed to during many, many of the reviews here at SlotMad. Winnings is never certain, but sometimes Lady Luck comes a knock, knock, knocking. 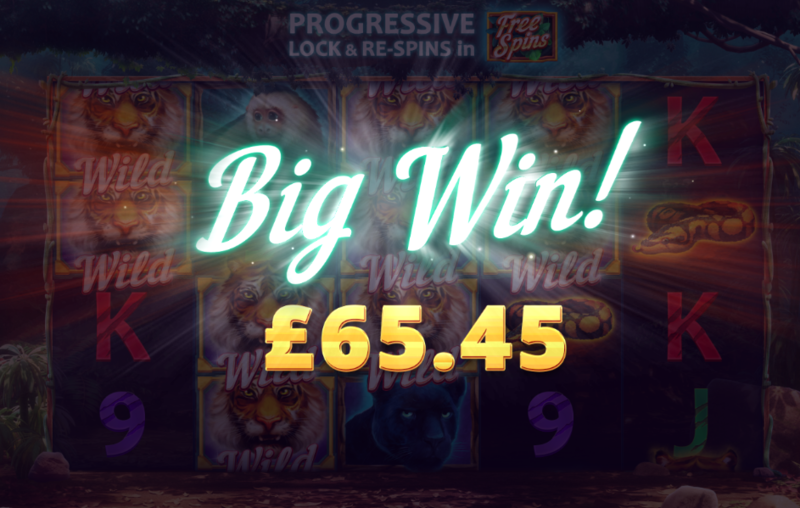 After an almost full screen of fishes paying close to 100x, we hit the free spins feature. Shouting for fish and fishermen for 10 spins, after the dust had settled another 150x our stake was in our account. Having sextupled our starting balance in less than five minutes, we felt very good about continuing the review. Another really nice feature which White Hat Group offers on their sites is the Game Provider section, where they offer a quick and easy overview of all the game studios. It allows you to find studios and thus games you haven’t tried before. Through this, we found our way to Cayetano Gaming and the game Dark Jungle. It is a fun, jungle themed game showcasing stacked wilds, free spins and a random gorilla. The Gorilla can award an instant win of 50 times your bet. Bling Bling. One thing which stood out during the review as some of your surely notice on the above screenshot is the Dream Catcher thumbnail having a Ultimate Texas Hold’em logo. Things like this show that we are all human and with over 1500 different games, sometimes thumbnails get a bit mixed up. We informed Dream Vegas and hopefully it has been fixed and when you go to play, you’ll get the beautiful Dream Catcher logo. Is Baccarat, or Punto Banco as it is called in some places, your favorite gambling flavour? Look no further. Outside of the normal takes on the classic game, there is also Dragon Tiger and Football Studio available which uses the same concept but mixes it up with some extra ways of winning. The Car or Cash promotions is the main long-standing promotion where there is a potential draw every month where a lucky winner takes home a Range Rover worth €35000. Don’t worry if you do not like English gas guzzlers, you can choose a cash prize instead and keep biking.